Muzo, the Ultimate Music Service for Business, has been designed to create the perfect ambience for your business at the touch of a button. Giving you access to thousands of profanity free tracks via 20 expertly pre-mixed streams. We're currently offering your business the chance to try Muzo completely free of charge for 14 days. Simply create an account on our website and begin to experience all Muzo has to offer… with absolutely nothing to lose. Whether you’re in hospitality, retail or the service industry, music is a key component in any customer-facing business. We spent months talking to hotels, restaurants, cafes, salons and other customer-facing businesses to establish what your requirements are, what matters to you in terms of ambience and what your team and customers want to listen to. The result is Muzo! Muzo is the perfect audio service for businesses, allowing you to create an atmosphere that keeps customers coming back. 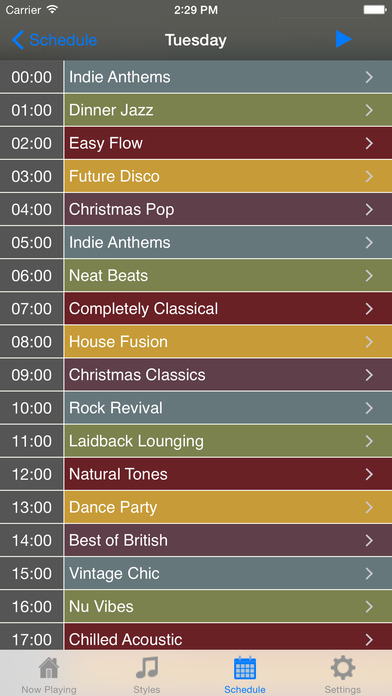 There are 20 streams to choose from which cover popular, relaxed, background, upbeat and specialised music. We believe it’s the definitive collection of legally licenced music for business. Sourcing the perfect music, ensuring that it’s legally licenced and doesn’t contain any obscenities requires time and expertise that smaller businesses could better spend elsewhere. This is where Muzo comes in. We’ve done all the hard work and created the perfect streams of music for whatever ambience you want to create. Muzo also provides you with the ability to schedule the music or switch styles instantly from your iPod, iPad or iPhone. Whether you need music for your hotel, restaurant, café, salon or any other customer-facing business, there is a style perfect for you. This software uses code of FFmpeg (ffmpeg.org) and LibMMS (launchpad.net/libmms) licensed under the LGPLv2.1 (www.gnu.org/licenses/old-licenses/lgpl-2.1.html) and their source can be downloaded at www.simplymuzo.com/help.